The entire DC Comics line of comic books will be re-launched with new #1 issues and feature "younger" and cosmetically redesigned versions of the heroes of the DC Universe. Written by Geoff Johns and illustrated by Jim Lee, Justice League will be the first of the more than 50 titles to debut in September, each of which will go on sale with same day digital releases via DC's various mobile applications and Web store. The initiative is designed explicitly to make the DC Universe more palatable for new readers and, in the words of DC Comics Co-Publisher Dan DiDio, "today's audience." 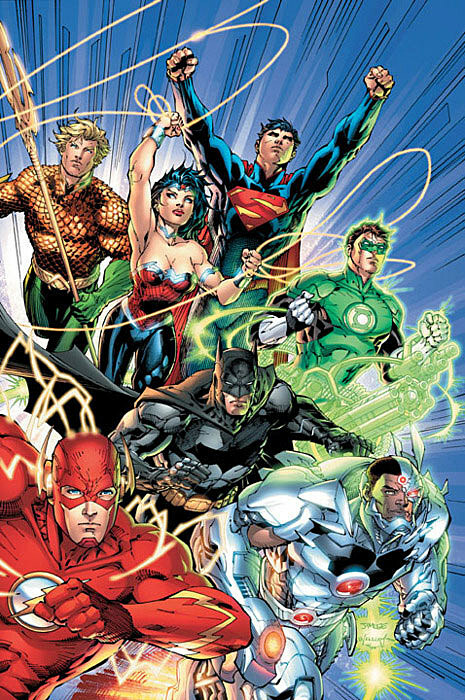 Batman, Superman, Green Lantern, The Flash, Wonder Woman and Aquaman are among the DC Comics characters who will be "injected with new life," according to Dan DiDio, who spoke with USA Today. DiDio's remarks would seem to indicate that existing DC readers are going to see major changes in the status quo and continuities of their favorite characters and titles. Among the major events that have informed various characters' modern histories include the death of Superman; Clark Kent's marriage to Lois Lane; the death of the second Robin, Jason Todd; the activities of Damian Wayne, the son of Batman and Talia al Ghul; Crisis on Infinite Earths, Infinite Crisis and 52, the stories that defined the nature of the DC Multiverse itself; the crippling of Barbara Gordon, the original Batgirl; the defeat of Batman at the hands of Bane, resulting in the installation of the homicidal Jean-Paul Valley as Batman; the fall and redemption of Green Lantern Hal Jordan; The Sinestro Corps War, Blackest Night and the rest of the Green Lantern "emotional spectrum" mythology; Final Crisis and the journey of Bruce Wayne across time; the emergence of Batwoman Kate Kane; and the consolidation and reconciliation of dozens of characters from the Golden Age of DC Comics and their descendants, as depicted in books like JSA, Justice Society of America and Starman. A DC spokesperson declined to comment on questions of continuity or the fate of Grant Morrison's Batman comics at this time and directed ComicsAlliance to The Source blog post. USA Today suggests that DC's intentions are at least in part a response to the success of Marvel Comics, whose market share has eclipsed DC's every year since 2002, and that Lee, Johns and DiDio consider the plan integral to the company's continued existence in the publishing market. "We're trying to set the table for the DC Universe's future success and health," said Lee. We have taken great care in maintaining continuity where most important, but fans will see a new approach to our storytelling. Some of the characters will have new origins, while others will undergo minor changes.